POTTING. 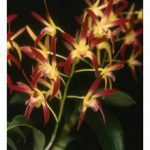 While a few species grow best when mounted on hardwood mounts or on tree fern slabs, the majority of Australian dendrobium species and hybrids grow well when potted in a 4:1-mix of pine bark (5-10 mm) and river gravel (5 mm). Black plastic squat pots with plenty of drainage holes are ideal. It is important not to use too large a pot – one that will comfortably accommodate the roots and allow enough space for two year’s growth is large enough.Dendrobiums are best repotted after they have flowered, just as their new growths are appearing between October and early December. If their roots are in good condition, simply transfer the plant to a larger pot and fill in with new mix. If some of the roots show signs of decay, remove them and all old potting mix and repot in fresh mix. LIGHT AND AIR. 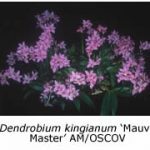 All dendrobiums grow and flower better if grown where they receive diffuse light (approximately 50% sunlight) for most of the year, full light during winter. They grow best if their pots can be suspended near the roof of the shade house so that receive good light and plenty of air movement. 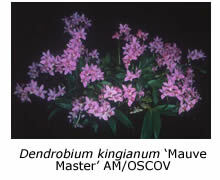 In summer native dendrobiums require frequent watering, especially during hot weather. However, they should not be kept continually wet and grow best if the mix is allowed to dry briefly before being watered again. In winter, much less water is needed, once a week being enough for flowering-sized plants grown under cover. FERTILISING. 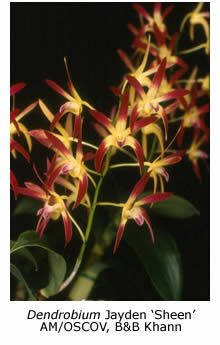 Australian native dendrobiums may be fertilised in two different ways or by a combination of both. One option is to apply granules of a slow-release fertiliser, such as Osmocote-Plus®, to the top of the mix in October (shake the pot so that the fertiliser enters the mix). The other is to apply a weak solution of a liquid fertiliser at fortnightly intervals between October and April. Use at only half of the manufacturer’s recommended concentration. Potassium-rich fertilisers, such as Campbell’s A®, generally result in better flowering.